Pull Up Exercise - Getting Great Upper-body Strength! Pull up exercise is an awesome body weight upper-body exercise. Its pulling action works your entire upper body, and all you need is a sturdy bar. Here you'll find info on how to correctly perform pull ups, variations you can try, and what to consider when working it into bodyweight workouts. Lets go! This is the most basic version. It strengthens your back, shoulders, and arms by working the biceps, lats, and shoulder muscles. Just make sure to do it right, so you don't injure your shoulders. Start with your hands positioned on that bar at slightly wider than shoulder width. Flexing your lats and upper back as much as possible, pull yourself up till your chin is above the bar and your clavicle has just touched it. Then, let yourself down. Remember to have your hands facing away from your body. Having your palms facing toward your body is a chin-up; a good exercise, but not what we're doin'. If you want to have some fun with it, do alternating side pull ups. Pull yourself up to one side of the bar, chin above your hand, then let yourself down and pull yourself up to the other side. This movement works your grip and arms more, and is a fun way to mix up your exercises. 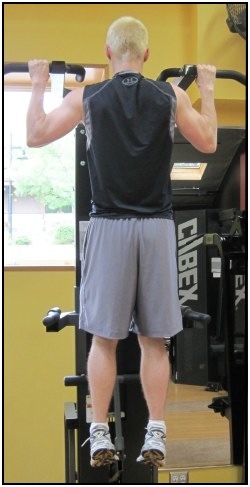 Clapping pull up exercises are another fun variation. From the hanging position below the bar, pull yourself up explosively and while you're high enough take your hands off the bar, clap, and then grab the bar again & lower yourself down. This creates a little more impact on your upper body, but trains you to move faster with a pulling, explosive movement. Try it! Behind the neck pull up exercise hits the upper back more directly. The difference is that you bend your head forward and pull the back of your neck up till it touches the bar. Fun stuff to try out. Just don't be too enthusiastic, or you might hit the back of your neck on the bar, which is not a fun experience! After a while, regular pull ups will be too easy for you. You'll want something harder to start really sweating again. For this, add weights to your exercise. The best way is to get a dipping belt, a special belt that you can hang weight plates on from between your legs. Most gyms have these, and they are pretty straightforward to use. If you have really broad shoulders you can use a backpack, but it's not the best option. The straps bind up around your shoulders as you let yourself down, and you want a good range of motion there. If possible, go for the belt! For all of these, be careful of your shoulders. It's easy to tweak then if you relax too much on the way down, and previous shoulder injuries may interfere. So, beware! Also, if you just don't have the strength for pull up exercises yet, go to a gym and find the Lat Pulldown machine. This allows you to work up the strength to lift your own bodyweight. When adding this into your workout, make sure you have a balance of push and pull based exercises. So, doing dips, push ups, and/or the bench press will do a good job of balancing your muscles (push based exercises to compliment your pull up). So, be safe and get working hard at it. It's a simple, great exercise - Go try it. Yes, now! • Click HERE to learn more about bodyweight workouts that compliment your pull up exercises!